We are currently witnessing an increase in telecommunications norms and standards given the recent advances in this field. The increasing number of normalized standards paves the way for an increase in the range of services available for each consumer. Moreover, the majority of available radio frequencies have already been allocated. This explains the emergence of cognitive radio (CR) – the sharing of the spectrum between a primary user and a secondary user. 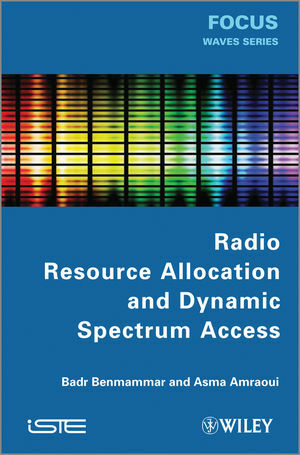 In this book, we will present the state of the art of the different techniques for spectrum access using cooperation and competition to solve the problem of spectrum allocation and ensure better management of radio resources in a radio cognitive context. The different aspects of research explored up until now on the applications of multi-agent systems (MAS) in the field of cognitive radio are analyzed in this book. The first chapter begins with an insight into wireless networks and mobiles, with special focus on the IEEE 802.22 norm, which is a norm dedicated to CR. Chapter 2 goes into detail about CR, which is a technical field at the boundary between telecommunications and Artificial Intelligence (AI). In Chapter 3, the concept of the “agent” from AI is expanded to MAS and associated applications. Finally, Chapter 4 establishes an overview of the use of AI techniques, in particular MAS, for its allocation of radio resources and dynamic access to the spectrum in CR. 1. Wireless and Mobile Networks. Badr Benmammar has been Associate Professor at UABT (University Abou Bekr Belkaïd Tlemcen), Algeria since 2010 and was a research fellow at CNRS LaBRI Laboratory of the University of Bordeaux 1 until 2007. He is currently carrying out research at the Laboratory of Telecommunications of Tlemcen (LTT), UABT, Algeria. His main research activities concern the cognitive radio network, Quality of Service on mobile and wireless networks, end-to-end signaling protocols and agent technology. His work on Quality of Service has led to many publications in journals and conference proceedings. Asma Amraoui is currently a PhD candidate; she is preparing a doctoral thesis on a topic of research that explores the use of artificial intelligence techniques in cognitive radio networks. She is attached to the Laboratory of Telecommunications of Tlemcen (LTT) in Algeria. Badr BENMAMMAR is performing his research activities in Laboratory of Telecommunication of Tlemcen, UABT, Algeria. Asma AMRAOUI is Currently preparing a doctoral thesis on a topic of research that explores the use of artificial intelligence techniques in the cognitive radio networks. She is attached to the LTT laboratory (Laboratory of Telecommunications of Tlemcen) in Algeria.